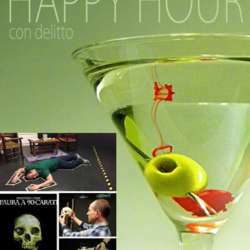 Crime at the Museum: a Happy Hour with scientific investigation! You must be a member of the Milan Horse and Nature Experiences Group to attend this activity. Would you like to join this group? This activity is a mixture of role-play, science-theatre and scientific laboratory; paticipants will act as investigation team of the scientific police: divided in teams they will collect clues, do laboratory tests, take measurements to put details together and come up with the solution of a mystery that is pervading the rooms of the Natural History Museum like thik fog.... The story evolves around a priceless emerald called "Profondo Verde", which has always been arousing irrepressible cravings ending in crimes and murder. The evening begins with an aperitif and a buffet, followed by approx 3 hours of incredible discoveries, dramatic turns of events, lots of fun and emotions while some light is slowly shed on the truth... at the end the experts moderating the game will explain the mystery and every team will find out if their deductions were correct.